I am passionate that we, as Christians, should be leading society in sorting out the mess that we have been part of creating, through ignoring or not giving sufficient credit to living simply and caring for God’s creation – core beliefs of St Francis of Assisi. Below is a talk that I gave at Church which hopefully helps give some background to why I think living lightly is fundamental to a belief in God and living a life that follows Jesus. Simplicity and humility: getting rid of what we don’t need, saying no to status symbols and pointless luxuries, refusing to bow under the yoke of consumer-driven toil. Take a few moments to think about things in your lives that fit these descriptions. Instead we should be using love, awe and wonder and the desire for shalom as the ground-rules for what we eat, what we wear, what we teach our children, what we give our money and time to. The word shalom is often simply translated as “peace” – but it is much, much more than that. Shalom means completeness, wholeness, health, peace, welfare, safety, soundness, tranquillity, prosperity, perfectness, fullness, rest, harmony and the absence of agitation or discord. The state of shalom is what we must strive for: harmony between all living things on God’s earth. Many search for fulfilment, happiness and contentment in material possessions, money, entertainment, etc. But those things do nothing to fill “that little hole in our soul” that only God can fill! Those things only serve to distract and prevent us from finding true peace…the shalom that can only come from Him who created and put all things into place. Living simply is also a lesson in humility, because the deeper we go into trying to ‘tread lightly on the earth,’ the more we realise how much further we have to go before we’ve arrived. There is no room for self-righteousness. We won’t have arrived until everyone else arrives with us and embraces the vision of living simply together. Living simply is a cure for consumerism. While consumerism isn’t all bad, in excess and wrongly focussed it is disastrous. My husband and I are part of a Christian network called Breathe. It is focussed on simpler living, with the tag line “Less stuff, more life”. One of the founders of the network, Mark Powley, published a book called “Consumer Detox”. He talks about the fact that the way we live is just not sustainable – we would need 5 planets if everyone was to live a Western lifestyle. Consumerism thrives on ignorance – we just don’t know who made most of the things we buy and what their working conditions were. If we did, I hope it would have more of an impact on the choices we make. Mahatma Gandhi put it best when he called for human beings to live simply so that others may simply live. One of the main reasons for St Francis to focus on living simply was the impact that our lives had on God’s creation. Verse 6 confirms that we are the rulers over God’s creation, as initially recorded in the creation story in Genesis. When God delegated some of his authority to us, he expected us to take responsibility to care for the environment and the other creatures that share our planet. Instead, we have not only subdued the earth but are in the process of destroying it. One of the most significant marks of St Francis’ spirituality is his acute sense of the presence of God in creation and in human history. Every being, and even everything, is a gift from God. Everything speaks to us of God and sends us back to God. 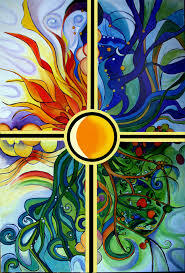 The universe in its unity and its diversity is a sacrament of God. For St Francis, loving the works of God and loving God was the same thing. To purposely destroy any aspect of creation is to deface the image of Christ present in all of creation. Christ suffers not only when people are denied their rights and exploited but when seas, rivers and forests are desecrated. St Francis teaches us how to respect all life. He also offers an alternative vision of what it means to be a truly human person in a deep relationship with God, other human beings and non-human creation. It is a relationship based on the recognition of the unity of all creatures, on companionship and respect. St Francis’ Canticle of the Sun conveys his mystical vision. In it, we hear an echo of the harmonious relationship between Adam and all other creatures described in the first pages of the Book of Genesis. The more St Francis reached out in solidarity to the poor and marginalised and to other manifestations of God’s creation – and allowed himself to be touched and transformed by them – the more Christ-like and authentically human St Francis became. How often do we really think about what it means that the earth we live in is God’s creation and how does the knowledge that it is His creation affect our actions? Do we stop to think, before we make a decision to buy something, what resources have been used to create it, who was involved in its creation, and what is the impact of using it on our environment? Our depletion of the ozone layer has made Brother Sun’s embrace not only warm and radiant but also potentially fatal. Our explorations of space have left junk littering the home of Sister Moon and the stars. Our pollution of the air has made Brother Wind’s breath toxic, particularly for children. Our treatment of our lakes, rivers, streams and oceans has made Sister Water sick. Our voracious appetite for fossil fuels has made Brother Fire the carrier of not only warmth and light but also destruction and war. Our lifestyles have abused our Sister and Mother Earth, and our work-addicted alienation from her natural rhythms and our own has led us, in many ways, to disown her. Our insatiable desires and the seductions of technology have deluded us into pretending that we might escape the embrace of our Sister Bodily Death, whom we too often flee in fear rather than accept in faith. We have damaged our communion – with our God, with creation, and with ourselves. We confess that we sinned through our own fault, from what we have done and from what we have failed to do. We firmly resolve, with the help of God’s abundant grace, to do penance and to amend our lives in part by reclaiming the wisdom of St Francis’ life and history. As we conclude, take a minute to reflect quietly on your own lives. What changes can you make to respect and honour God’s creation and to live simply, in the same way as St Francis did in his life? After the example of Saint Francis. INTEGRITY OF CREATION: AN ISSUE FOR RELIGIOUS TODAY. GLOBAL WARMING AND CLIMATE CHANGE. Prepared by the Global Warming Working Group of the JPIC Promoters, Rome, Italy March 2002.